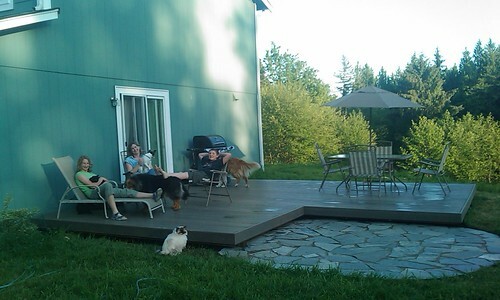 We finished the deck, a whole day ahead of schedule. Every day last week I came home and added 3 or 4 new planks to the deck, so by the time I started Saturday morning I only had half of the 20-foot side to finish up. On Saturday afternoon Ron and Sue came up, and Ron helped me cut all the planks I needed for the 12-foot side. Dana and I put about half of them on before we gave up Saturday evening. On Sunday morning Dana and I finished planking the deck, and then while Dana went to visit her grandmother Katie and I put a facia board around the edges to finish it off. Dana and the kids moved the patio furniture onto the deck, and I hauled the barbecue back around, and Sunday night we ate dinner on the new deck. I have a tendency to stand in the sliding door and look out at the deck and think: "I did that."